Thank you for choosing to stay with us. The following guidelines are to assist you and other guests to make your stay enjoyable. We are committed to making Goondiwindi Top Tourist Park a place to which you will want to return. If you have any special requirements or need our help, please ask. We also welcome any suggestions. There are two FREE gas BBQ areas within the park. Please leave BBQ and surrounding area clean after your use. Do Not leave BBQ unattended whilst cooking. Please switch off the gas when finished. These are allowed during daylight hours, all persons must wear helmets. These items are not to be used in the main entrance/exit area. There are 2 camp kitchens in the park, please leave clean after your use. All accommodation/sites to be vacated by 10am on day of departure. Early departures should you wish to depart before reception opens; please make alternate arrangements the day before. Late Checkout – Fees apply if you’d like to extend your stay (depending on availability) please do so before 8.30 am. All breakages or damage to park property must be paid upon departure. Reserves the right to evict any persons causing problems. Laws provide for the eviction from the park of all intoxicated or drug affected persons or those whose behavior or language is offensive. Persons evicted will not be refunded and future booking rights will be forfeited. Please consider others within the park by restricting noise from music and social gatherings between the hours of 10pm – 5am. If you have a concern about noise, please contact the managers so action can be taken. After hours phone number is displayed on the office reception. Management are on site 24hrs. Parking is allocated for all sites/accommodation (one car space per site/accommodation). Please do not park on the roadways. No temporary clothes lines are permitted. Details of our policy is available at reception, please note that we are unable to refund any monies for late arrivals, early departures or in the event of inclement weather. Please lock your cars and accommodation when you leave them. Management cannot accept responsibility for theft of personal possessions. All visitors should be registered on arrival (fees apply). Registered guests are also responsible for their visitors’ behavior. Children under the age of 12 years must be supervised by an adult at all times. No trenches to be dug, no shade cloth or tarps permitted. No fires are permitted at any time. No washing of cars, boats or caravans. Points are located at the exit of the park near the phone box and the large camp kitchen on the eastern side of the park. If an emergency occurs staff will notify you. Please don’t attempt to move your vehicles. This policy has been formulated to assist in providing a cohesive environment for all at Goondiwindi Top Tourist Park. Dogs are permitted in certain cabins only. Fee applies for Dogs inside our Dog friendly cabins. The dog must be less than 15 kilograms. Generally only one dog per site (some variations may apply). The dog is to be kept on a leash at all times within the Park and not left unattended. Dog droppings to be scooped up immediately and placed in a plastic bag to be disposed of at bin station. Barking or aggressive behaviour will not be accepted and you may be asked to leave. Linen is provided in all of the cabins with the exception of the budget cabins, which is only provided to the double bed only. There is no linen provided on the bunk beds in the Cabins Linen packs are available for $15 per bed. We reserve the right to move guests to the accommodation of our choice within the requested category. Parking is for one car space per site. Visitors should park their car in the visitor parking area at the front of the property. No visitor cars are allowed in the park without consent from management. A deposit (minimum 1st night in full) is required to secure each reservation within 7 days of making the original booking. No reservations will be guaranteed without a deposit. Balance is to be paid upon arrival (personal cheques will not be accepted on arrival for payment of accounts). Minimum booking applies for special events and peak times. Check out time is 10am. All keys are to be returned on check out. All Guests shall accept liability for themselves, their children, furniture, fixtures and all the fittings in the accommodation and within the park. Guests must comply with park rules & regulations as a condition of stay, as given to when checking in. Goondiwindi Tourist Park shall not be responsible for personal injury, or be liable to compensate guests for loss, theft or damage to any vehicle or personal property on or brought into the premises. 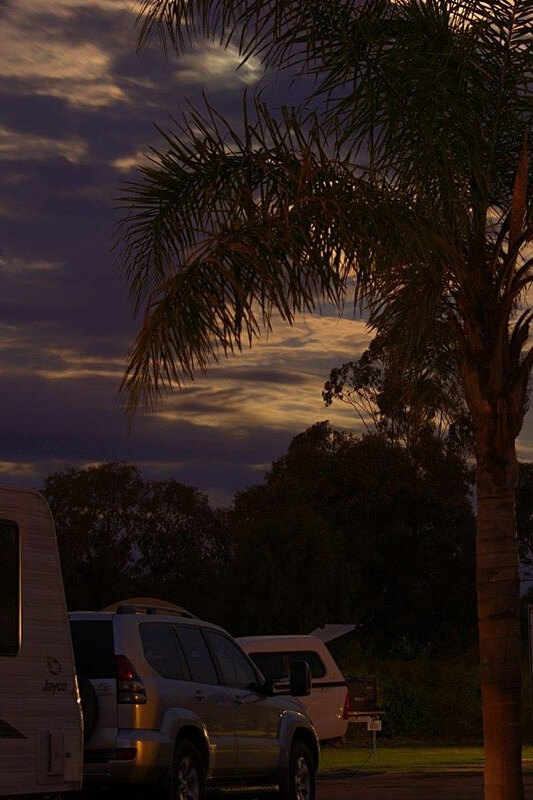 Goondiwindi Tourist Park suggests that guests securely lock their accommodation, caravan & vehicles. You agree any charges for services to you, not billed at the time of departure, may be added to your account for settlement as arranged or may be charged to your credit card used to pay the account at time of departure for all breakages, damages, missing items, extra guests or accommodation left in an untidy manner will incur an additional cleaning cost at $50 p/hour upon notification. Smoking in accommodation will incur a cost of $500. Check in time is after 2pm (depending on availability). Check out time is 10am. No Cheques are accepted for the balance of the booking upon check in, Cash or Eftpos only is accepted. All arrivals after 6pm prior notice must be given. Please leave a contact mobile number. This reservation has been accepted for the number of guests stated. Additional guests will incur further charges and/or the requirement for additional sites. All Tariffs quoted are subject to change without notice. If cancellations happen within the 7 days of arrival date then your deposit is forfeited. If cancellations happen before the 7 days of arrival date a $30 administration fee will apply. All refunded monies will be paid by direct deposit or by cheque at the start of each month. REFUNDS ARE NOT GIVEN ON PREMATURE CHECKOUTS UNDER ANY CIRCUMSTANCES AT ANY TIME. We will not refund any monies as a result of a code red declaration. We look forward to welcoming you to Goondiwindi Top Tourist park on your arrival. Please do not hesitate to contact one of our friendly reception team if we can be of any more assistance.